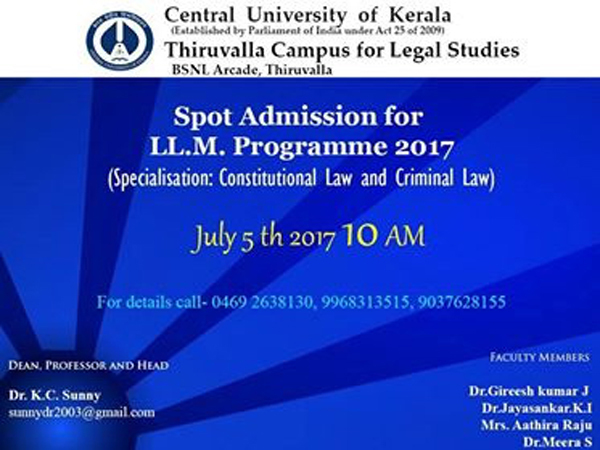 Applications are invited from eligible candidates for Spot Admission to LLM programme at Central University of Kerala (Thiruvalla Campus for Legal Studies) for the academic year 2017-18. All candidates having a 3 or 5 year regular L.L.B. Degree from a recognized University (studied in 10+2+3+3 / 10+2+5 system) with at least 50% marks or equivalent grade point in the aggregate. For SC / ST candidates, up to 5% relaxation in the minimum requirement of marks is granted.